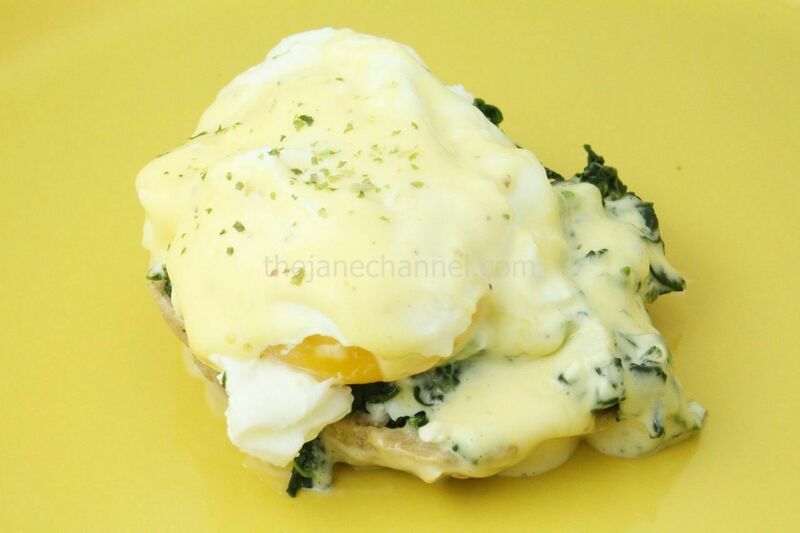 A variation of Egg Benedict, Eggs Florentine substitutes the ham/bacon with spinach. The Hollandaise sauce could not have been easier to make. Just make sure the butter is hot and that you pour it very slowly in the running blender. You also must have enough ingredients for 6 servings in the blender in order for the sauce to blend well. Bring the water to boil, then reduce the heat to medium. Heat oil or butter over medium-high heat. Add garlic and saute for 1 minute. Add spinach and saute, stirring for 2 minutes. Season with salt and freshly ground pepper and nutmeg to taste. Toast the English muffin. Spoon the sauteed spinach on the toast. Top with the poached egg and drizzle with hollandaise sauce. Season with freshly ground black pepper and serve immediately.